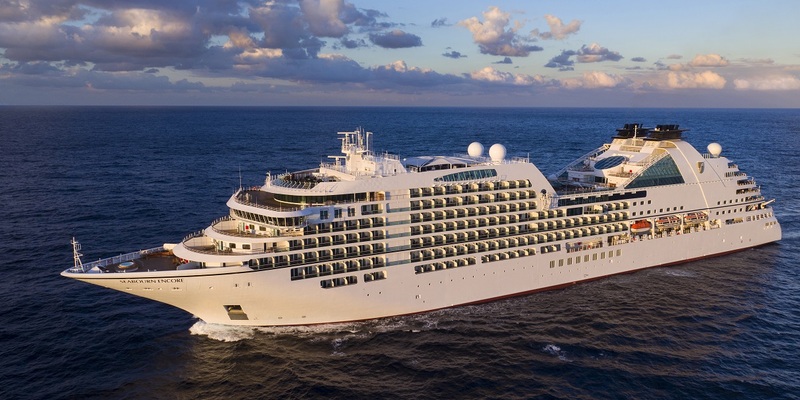 Seabourn’s latest launch takes luxury to new heights – but should you change a winning formula? The light show in the Java Sea is incredible. Lightning is strobing all around our ship, so bright that the wake glows white in the blackness. Thunder crashes right over our heads. Despite an intense tropical downpour, the water is calm. Down on deck four, the hubbub of dinner carries on, uninterrupted. 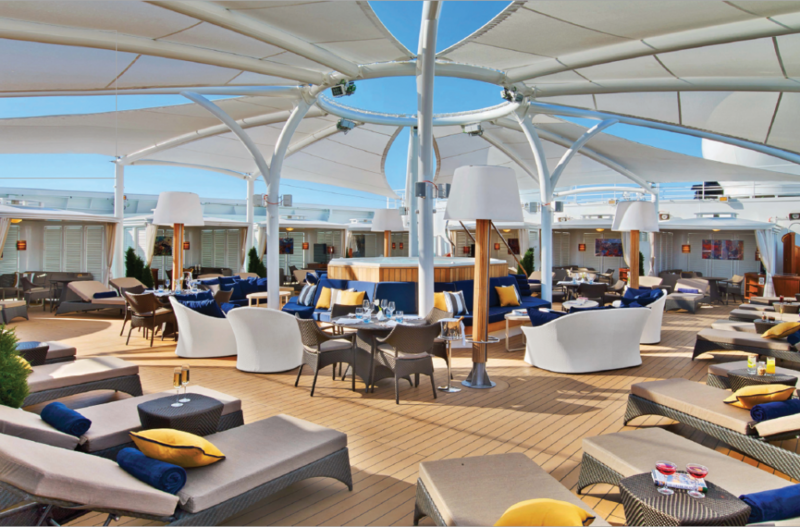 But my partner and I have picked the best night of the lot to try al fresco dining in The Colonnade, the ship’s informal restaurant. The other passengers have been driven indoors by the rain but one crew member after another sneaks outside to watch; officers, waiters, sommeliers bringing more wine, the maître d’. We swap storm stories, because everybody has one. It feels like a little private party; like some special bond has been established between our merry band of storm-chasers. The brand loyalty is incredible. OK, I’m on the maiden voyage, which is bound to attract a lot of regulars, but two-thirds of the passengers are repeaters. I’m sailing from Singapore to Bali for eight days but a very large number are carrying on to Sydney, the end of the next cruise. One lady from the UK boarded in Athens in December, when the ship was fresh out of the yard, and won’t be disembarking until Encore returns to the Mediterranean in May. That’s five months on board, longer than a world cruise. So what is it that brings these Seabourn fans back time and again? The line’s reputation for sumptuous but understated luxury is welldeserved, but Encore isn’t quite the mixture as before. A step up in size from her sister ships, with ample space for 600 guests, she looks a little different too. Celebrated hotel designer Adam D Tihany has been brought on board to create the ambience of a luxury yacht, so there’s plenty of polished mahogany, gleaming chrome and rich, nautical blue. Everything is curvy and invites your touch, from silk cushions in jewel colours to smooth leather and cool marble. Encore’s Observation Bar oozes glamour. Every detail whispers quality – from the mountains of soft pool towels to the Molton Brown goodies in the bathrooms, custom designed for Seabourn. And the line is rightly proud of its collaboration with superstar chef Thomas Keller. 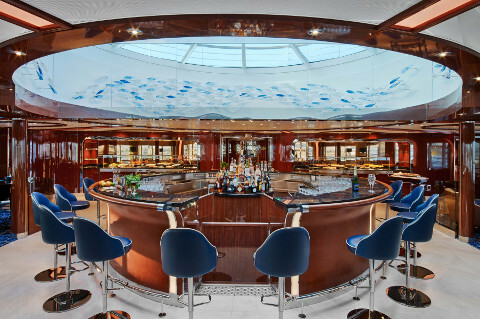 The only American with three Michelin stars to his name, Keller’s restaurants are appearing on other Seabourn vessels but Encore’s is uniquely purpose-built – a classy establishment that resembles a very upscale New York steak joint, all rich browns and golds. The food is classic steakhouse fare, just done better; my crabcake on aioli is exquisite, and the roast chicken is perfection. Everybody gets to eat here at least once per cruise, and Keller’s dishes appear on other menus throughout the ship, with flourishes in The Restaurant (the main dining room) such as Sonoma duck breast, and herb- roasted saddle of Elysian Fields Farm lamb (everything comes from small suppliers, carefully chosen by Keller himself). Less formal dishes appear in The Colonnade, such as posh plates of ribs and fried chicken for sharing. The Restaurant is a real Adam Tihany masterstroke, all creamy white with touches of colour from whimsical blue-and-chrome chandeliers, blue water glasses and pale gold charger plates. This being a luxury line, you can turn up when you like and there are plenty of tables for two. There’s also a small Japanese restaurant, Sushi, doing a roaring trade in bento boxes for lunch and sushi and sashimi in the evenings. But The Colonnade, where we watch our nightly thunderstorms, is surely the most romantic venue: an elegant buffet by day and à la carte at night with flickering candlelight and changing themes, from Mediterranean to Indian banquet. Among Encore’s other innovations is a wellness programme designed by Dr Andrew Weil, a US guru of “mindful living”. Dr Weil is present in person on the maiden voyage, and his talks are inspiring: I go to lectures on instant happiness and healthy ageing a bit of a sceptic but emerge a devoted fan. His influence permeates the whole ship, from free yoga and meditation classes to a mindfulness theme, listed daily in the activity programme (typically “joy” or “compassion”, though I fear my daily theme is usually “indulgence”). Seabourn Encore is spending her maiden season in Australasia so we steam south through the Java Sea, calling at ports I’d barely heard of, like Surabaya, Semarang and Probolinggo. Shore days are a complete contrast to the sybaritic life on board. The ports are industrial and the cities sprawling and traffic-choked: Indonesia is one place where I’d definitely recommend booking a shore excursion, expensive as they are, rather than going it alone. We spend a day at the massive Buddhist monument of Borobudur, which probably looks lovely when it’s not pouring with rain, and join a Jeep safari from Probolinggo, climbing through dense rainforest to moody Mount Bromo, a sulphur-belching volcano. In Komodo we join a hike with the park rangers on a wet, steamy morning, in search of the famous dragons. We spot four: two basking, clearly not hungry, and two on the prowl. “A tourist was eaten in 1974 when he wandered off on his own,” says our guide, wielding a large forked stick. 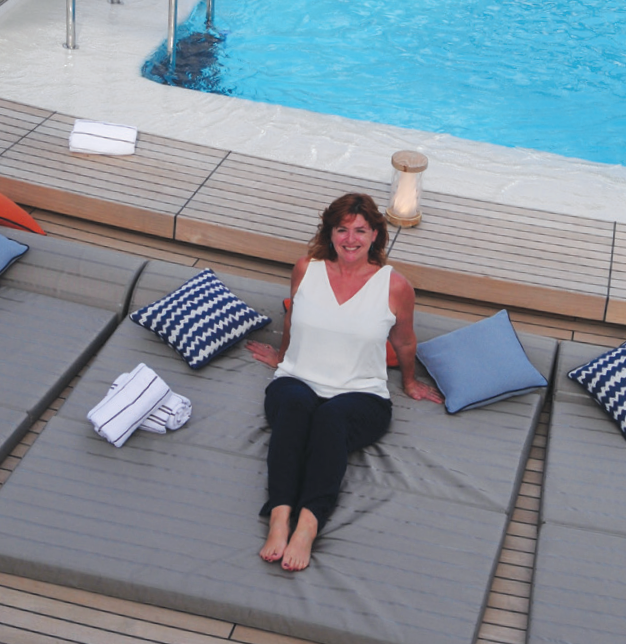 Days on board are dedicated to luxury, and it really doesn’t come much better than this. Many guests start the day at Seabourn Square, the coffee shop/library/concierge area, where chief barista Joel roasts the beans himself and makes a mean flat white. We usually follow this with late breakfast on the aft deck, then sunbathing, reading and swimming – although some days we go to the lectures, which are excellent, or join a meditation class. Waiters roam the decks with trays of drinks they just happen to think you might like, so it’s iced spritzers one day, strawberry daiquiris the next. Lunch can be taken by the pool, where there’s a salad bar and freshly grilled sea bass. Then it’s more swimming, a snooze, and next thing you know it’s cocktail hour. The retreat is ringed by private cabanas. I’m not saying this is some kind of booze cruise (most days I manage to abstain until gin-and-tonic time) but it’s a hell of a way to live. And if even this decadence isn’t enough, you can splurge on a private cabana at The Retreat on the top deck, where there’s Bollinger on tap, delicious lunch made to order, hand-crafted cocktails and big, squashy loungers. Cabanas are cheaper on port days ($249 as opposed to $349) so we very lazily skip Surabaya, no hardship in 90 per cent humidity, and blow the budget on The Retreat for the day. Worth it? Absolutely; it would be the perfect venue for a special occasion. Normally, devotees of a cruise line are suspicious of a new, bigger ship. Those I spoke to agreed that Seabourn Encore was different from her sisters, but the approval was unanimous. For one thing, the new ship offers more choice, especially at night. The piano bar at The Grill by Thomas Keller is the hippest place for pre-dinner drinks, with a great pianist and a fine line in martinis. Some nights, we’d listen to the jazz duo in the beautiful Observation Bar, a light-filled lounge high on deck 11 with 270-degree views and a different theme of tapas every night. After dinner, there are shows in the Grand Salon, which were mixed. A new production, An Evening with Tim Rice, was superb, narrated by the triple Oscar-winning lyricist, with the ship’s singers performing numbers from Chess, Jesus Christ Superstar and Evita. I enjoyed the illusionist on another night although a show by three Australian tenors was sadly dumbed down, leaving opera fans feeling short-changed. But this isn’t a ship that needs round-the-clock entertainment. 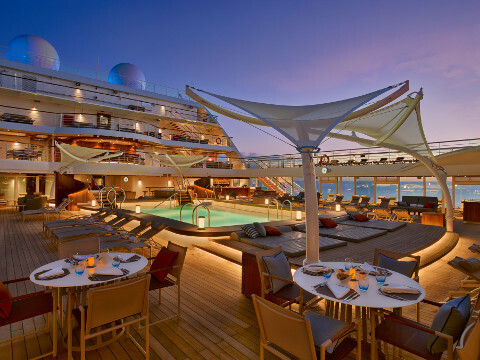 Friendly people, great cocktail music, and on one night a glamorous deck party – you’ll find that’s all you need. 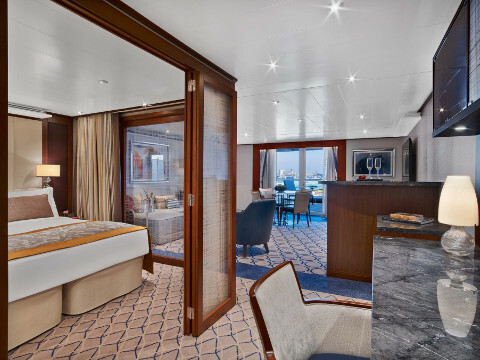 As for our fellow passengers, Seabourn certainly attracts money, but it’s a classy rather than flashy crowd and we mingled with doctors, bankers, patrons of the arts and globetrotting retirees. As we disembarked, Handré gave me a hug and I felt a sort of irrational glow; as though I’d joined the Seabourn family. The Gems of the Java Sea cruise from Bali via Komodo and ports in the Java Sea to Singapore costs from £4,299 for 10 days, ﬂights extra, departing March 12, 2018 (0843 373 2000, seabourn.com).